For pictures/videos of previous retreats, please look here. Frequently asked questions can be found here. Retreat in Hungary. All are welcome. Venue: Vackor Var, Kecskemet, Hungary. Start/End Time: 17.00 23rd August 2019 – 14.00 28th August 2019. Co-ordinator: For details and to register, please contact Rita. August 30 – September 3, 2019, Steyl, the Netherlands. This retreat will be held in Steyl. All are welcome. Venue: Centrum Sint Michaël, Steyl, the Netherlands. Retreat Start/End Time: August 30 – September 3, 2019. Registration is open from May 7th until July 15th. Co-ordinator: To register, please contact Christian . September 6 – 10, 2019, near Munich, Germany. Venue: Domicilium, 83629 Weyarn, Germany. Retreat Start/End Time: Friday Sept. 6 18:00 – Tuesday Sept. 10 14:00. Cost: €260-352 depending on room choice. Co-ordinator: For questions, please contact: zen in münchen. September 13 – 17, 2019, Newbury, Berkshire, UK. This retreat will be held at Cold Ash Centre, nr Newbury. All are welcome. Venue: Cold Ash, Thatcham (nr Newbury), Berkshire, UK. Retreat Start/End Time: September 13 – 17 2019. Co-ordinator: For more information, please contact Richard. To assist participants with retreat planning, some provisional dates for future retreats are listed below. However please note that this information is subject to change. September 15 – 19, 2021, Steyl, NL. March 29 – April 2, 2019, Newbury, Berkshire, UK. March 24 – 28, 2019, near Munich, Germany. March 13 – 17, 2019, Bugac, Hungary. March 1 – 5, 2019, Hoepertingen, Belgium. January 3 – 8, 2019, nr Philadelphia, PA, USA. December 26 – 31, 2018, Tallahassee Chan Center, Tallahassee Florida, USA. September 7 – 11, 2018, near Munich, Germany. August 31 – September 4, 2018, Hoepertingen, Belgium. August 24 – 28, 2018, Newbury, Berkshire, UK. August 16 – 20, 2018, Bugac, Hungary. April 30 – May 5, 2018, Montreal Zen Center, Montreal, Canada (Closed Retreat). March 23 – 27, 2018, Ascot, UK. March 14 – 18, 2018, Bugac, Hungary. March 9 – 13, 2018, near Munich, Germany. March 2 – 6, 2018, Steyl, The Netherlands. January 3 – 7, 2018, near Philadelphia, PA, USA, with Public Lecture. December 26 – 29, 2017, Mexico City, MEX. September 8 – 12, 2017, near Munich, Germany. August 30 – September 3 2017, Hoepertingen, Belgium. August 22 – 26, 2017 Bugac, Hungary. August 18 – 22, 2017, Ascot, UK. April 25 – 28, 2017, Philadelphia, PA, USA. March 15 – 19, 2017, Oradea, Romania. March 10 – 14, 2017, near Munich, Germany. March 1 – 5, 2017, Steyl, the Netherlands. February 17 – 21, 2017, Ascot, UK. January 3 – 8, 2017, IHMSC, Malvern PA, USA. September 16 – 18, 2016, Bremen, Germany. September 9 – 13, 2016 near Munich, Germany. August 31 – September 4 2016, Hoepertingen, Belgium. August 25 – 28, 2016 Oradea, Romania. August 19 – 23, 2016, Ascot, UK. March 11 – 15, 2016, Ascot, UK. March 4 – 8, 2016, Steyl, Netherlands. February 25 – 28, 2016 Oradea, Romania. February 19 – 23, 2016, near Munich, Germany. January 2 – 6, 2016, Immaculata PA, USA. September 11 – 15, 2015, nr Munich, Germany. September 4 – 6, 2015, Bremen, Germany. August 28 – September 1, 2015, Steyl, Netherlands. August 17 – 22, 2015, Oradea, Romania. August 7 – 11, 2015, Ascot, UK. May 15 – 19 2015, PA, USA. March 13 – 17, 2015, Hoepertingen, Belgium. March 5 – 8, 2015, Oradea, Romania/Hungary. February 27 – March 3, 2015, near Munich, Germany. February 20 – 24, 2015, Ascot, UK. January 9 and 10, 2015, Mexico City, Mexico. 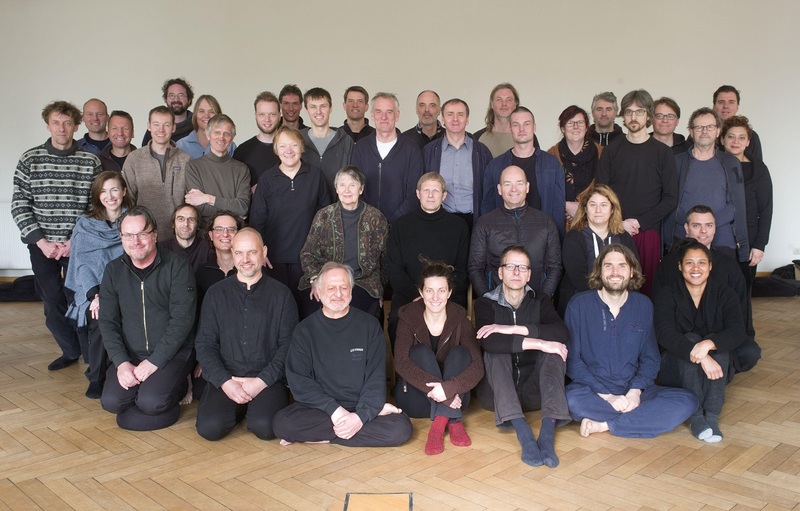 December 26, 2014 – January 1, 2015, Dharma Drum Retreat Center, New York, USA (Guest Teacher). September 10 – 14, 2014, Immaculata, PA, USA. September 3 – 7, 2014, Hoepertingen, Belgium. August 18 – 23, 2014, Oradea, Romania. March 21 – 25, 2014, Tannenhof, near Munich, Germany. March 13 – 16, 2014, Hungary/Romania. March 7 – 11, 2014, Surrey, UK. February 21 – 25, 2014, Steyl, Netherlands. February 10 – 14, 2014, Averbode Abbey, Belgium (Closed Retreat). January 3 – 7, 2014, Haverford, Pennsylvania, USA. September 10 – 13, 2013, Tannenhof, near Munich, Germany. September 2 – 6, 2013, Steyl, Netherlands. August 22 – 25, 2013, Oradea, Romania. August 16 – 18, 2013, Surrey, UK. August 7 – 11, 2013, New York, USA. March 23, 2013, Pescara, Italy. March 15 – 19, 2013, Tannenhof, near Munich, Germany. March 4 – 8, 2013, Hoepertingen, Belgium. February 21 – 24, 2013, Oradea, Romania. January 2 – 6, 2013, Pikesville, MD, USA. September 9, 2012, Leuven, Belgium. August 23 – 26, 2012, Nagykovácsi, Hungary. August 13 – 17, 2012, Baarlo, Netherlands. April 20 – 22, 2012, Claverack, New York, USA. March 23 – 27, 2012, Tannenhof, near Munich, Germany. March 5 – 9, 2012, Steyl, Netherlands. February 24 – 26, 2012, Surrey, UK. December 27 – 29, 2011, Budapest, Hungary. November 21 – 23, 2011, Philadelphia, PA, USA. September 6 – 11, 2011, Immaculata, PA, USA. August 26 – 30, 2011, Egmond, Netherlands. August 13 – 16, 2011, Budapest, Hungary. March 25 – 27, 2011, Tannenhof, near Munich, Germany. March 14 – 19, 2011, Steyl, Netherlands. If you want to add an item to the list of upcoming retreats, please send us an announcement to this address. Please specify: venue, start and end dates/times, cost, and an email address for further information and registration.